A two-time USA Today Bestselling Author brings you the second book in the Midlife Journey Series. When you’re fifty, it’s hard to trust again, even more so when your mother’s mantra, “Never More,” keeps running through your head. Beverly is starting over and taking charge of her life. She’s moved, has her own business, two puppies, friends, and most surprising to her, a new relationship! But can she trust her heart and him? It’s hard to let go of old hurts. If you’re over fifty and have ever been betrayed by someone, you need to read this book and know that miracles can happen and dreams can come true. To get your free books from Dianne, just cut and paste: http://ow.ly/wgVG304NU9N Enjoy! 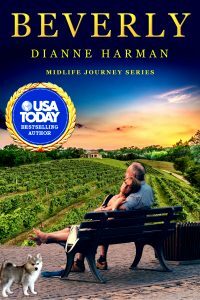 Dianne Harman, draws her stories and characters from a diverse business and personal background. She owned a national antique and art appraisal business for many years, left that industry, and opened two yoga centers where she taught and certified yoga instructors. She’s traveled extensively throughout the world and loves nothing more than cooking, playing backgammon with her husband, Tom, and throwing the ball for their dog, Kelly.